Almost everywhere you look in a town in Britain, you will see small yellow rectangular signs stating cryptically "At any time". Above these words is a small blue circle with a red line through it. For some reason, this blue circle is supposed to represent "parking", as the meaning conveyed by the signs is meant to be "no parking at any time". There must be hundreds of thousands (millions, perhaps?) of these signs in the UK. They are so utterly ubiquitous that most people don't even see them, except when they're trying to park a car. 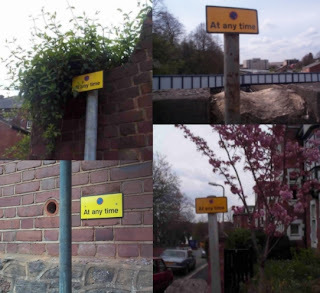 Curiously, we've found that if we ask a typical British adult "Do you know those little yellow signs which say 'at any time'...? ", they don't know what we mean. 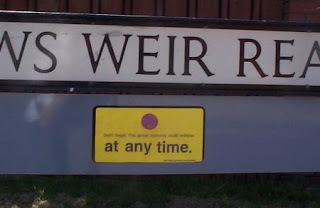 In the spirit of the previous Interdimensional Pixie Broadcast Network exhibition (which involved red triangular roadsigns), we decided that these little yellow rectangles could be used to convey furtive messages of inspiration and enlightenment. Taking into account their omnipresent nature and the quiet authority they carry, we considered various messages which could be spliced onto the phrase 'at any time'. The underlying theme is one of spontaneity, possibility, and the unexpected. 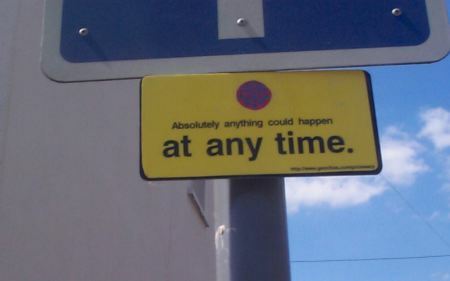 "Absolutely anything can happen at any time." 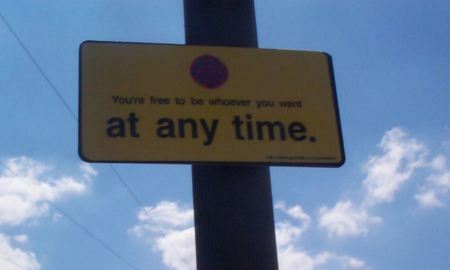 "You're free to be whoever you want at any time." 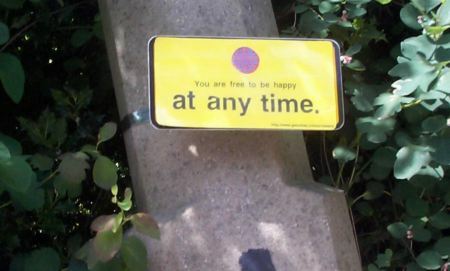 "You are free to be happy at any time." "Take heart. 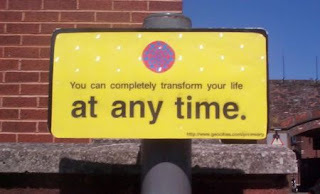 Things could drastically improve at any time." "You can completely transform your life at any time." "You can completely change your point-of-view at any time." "Remember. You can take off that mask at any time." 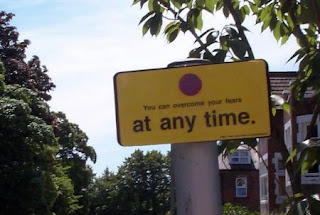 "You can overcome your fears at any time." 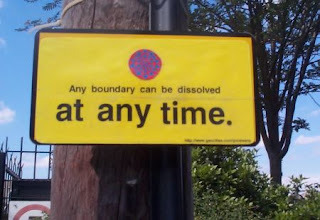 "Any boundary can be dissolved at any time." 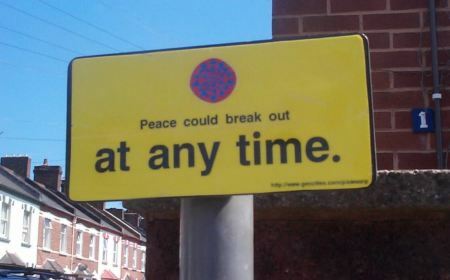 "Peace could break out at any time." "Go on. 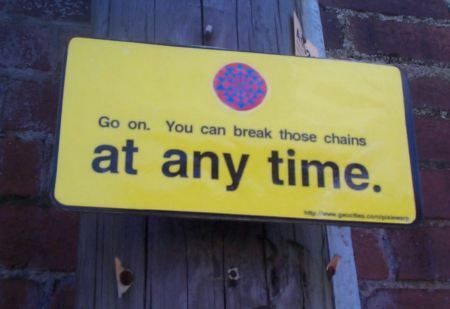 You can break those chains at any time." "Live in the moment. Your life could end at any time." "Be grateful for your life. It could end at any time." "Don't forget. The global economy could collapse at any time." 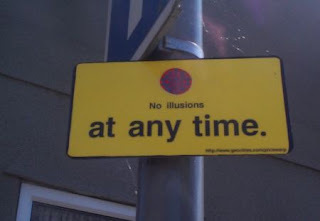 "No illusions at any time." "No ambiguity at any time." 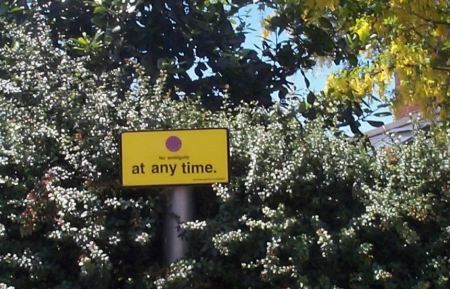 They were designed to follow the existing "at any time" signs as closely as possible, being exactly the same size, using the same font, etc. We printed them on thick yellow paper, cut them out, and stuck two-sided tape around the edges of their reverse sides. We decided to replace the blue-circle-with-red-line-through-it symbol with a circular symbol which we felt might be more beneficial to the unsuspecting viewer. We chose the Buddhist Sri Yantra used in one of the triangular roadsigns, reproduced in blue and red. Here is the original JPEG which was printed out and stuck on. 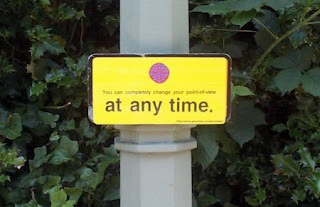 The signs were then laminated with transparent stick-backed plastic to avoid rain damage. Here they are. And remember, this could happen in your town at any time. "Absolutely anything could happen at any time." "You can drop your preconceptions at any time." 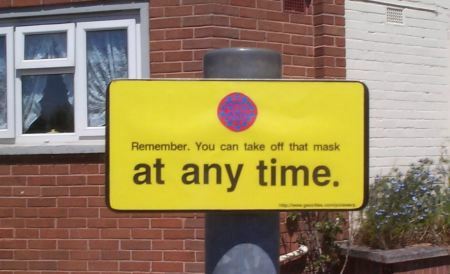 It's Paul Giblin here from the St David's Ambience Society/The Future Sound of Exeter, just emailing to say what a great job I think you're doing, the world needs more active surrealists (even if you don't subscribe to the label, I'm sure you know what I mean) so keep up the good work. 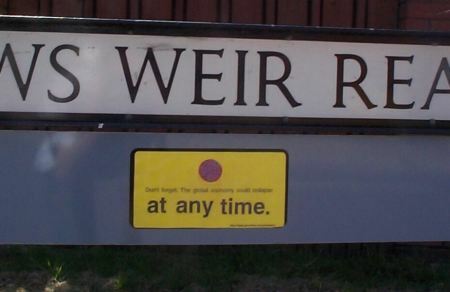 "Ok, as the person who got the most coverage from the last lot of signs which went up, I have to congratulate you on this one. Excellent. Unfortunately, I'm not out and about so won't be able to track these down. I will however do my utmost to get at least one before they all go. Well done, mysterious ones. I never did find out who you were. Steve Stewart"
Your groovyness is a candle lighting wind. 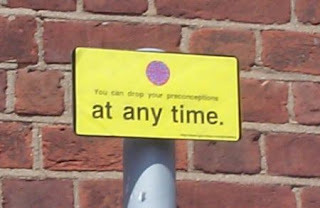 "Hi, I saw some of your signs around Exeter and subsequently checked out the web site. FANTASTIC. I'm glad to see someone with a sense of humour AND an original idea!! I've been doing a few wacky things around the town recently and I'm pleased to see I'm not the only one. Keep up the good work. 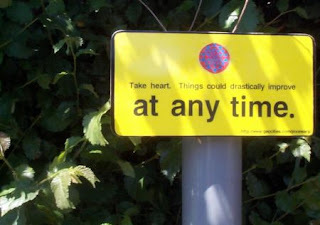 "Thanks for keeping me up to date with Pixie news - have written a short blurb for Bizarre about the 'at any time' exhibition and it will go in issue 49 - out in July. Just checking it is OK to use pics. If you know of any websites, publications, individuals, or arts organisations which might approve of our work, please inform them of this site. Thank you.